China’s notorious Yulin Lychee and Dog Meat Festival is underway despite earlier claims that the controversial event, which celebrates eating dog meat, would be banned this year. Animal activists are engaging in stand offs with meat trucks en route to Yulin in China’s southern province of Guangxi. It is believed many of the dogs sold at the festival are stolen. The festival opened Wednesday after Chinese authorities reached a compromise with vendors in which each stall would only display two dog carcasses, AFP reports. Authorities told the media they have no power to ban the event, which is not officially sanctioned by the government, as eating dog meat is not illegal in the country. Tense scenes have been reported at the Dongkou and Nanqiao markets where Beijing-based journalist Marcel Wink claimed foreign attendees were being watched closely by vendors. The festival began in 2010 and is traditionally held during the summer solstice as dog meat is considered to be beneficial during the hot summer months. There is a long tradition of eating dog in China, South Korea and some other Asian countries. Supporters say foreigners should not interfere in local culture. The festival has garnered huge international attention over the years with activists from outside China joining protests. AFP says one of their reporters was told by vendors to delete photos taken at a stall. Animal rights groups posted videos of efforts to block trucks carrying dogs destined for the market. The Animal Hope and Wellness Foundation claims it rescued dogs that were being clubbed in the face and skinned alive from several slaughterhouses in the area. HSI says that more than 800 dogs and some cats in Guangzhou, China, were rescued after Chinese activists engaged in a 10-hour stand-off with a truck. 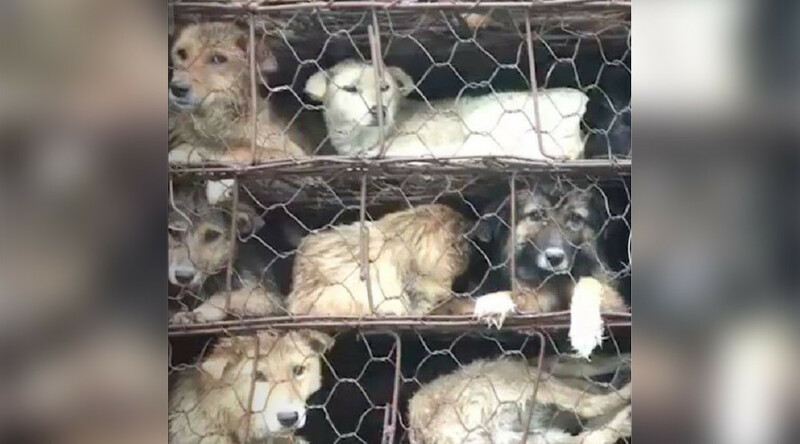 The dogs were believed to be en route to Yulin. Police reportedly took custody of the dogs and brought them to a shelter in Guangzhou. Meanwhile, Animals Asia believes the focus needs to be wider, calling for an outright ban on dog meat. The organization, along with scores of Chinese animal rights NGOs, is urging activists not to buy dogs from traders as it pushes up their prices and profits. Chinese residents have expressed mixed opinions about the festival on Weibo. Some social media users voiced their opposition to eating dog meat pointing out the differences between canines and other animals. Many others said they recognised the practice as a Chinese tradition and respected traders right to earn a living and people to consume the meat even if they didn’t eat it themselves.